The keeper partially redeems himself by making a great stop from Griezmann's fierce drive from the left-hand side of the box. Pet peeve for this World Cup- absence of 1 defender on each post. I don't see the benefit of another player floating in space. Griezmann would have deserved that goal. Holy cow what a save! That's one way to start redeeming yourself, what a thunderbolt and what a stop! THAT is an impressive save. Especially since he just got beat. Way to recover! Enyeamaaaaaaa!!! What a performance! Jekyll and Hyde! We need a second goal France, Go Go Goals~! Tom, surely this game wont have stoppage time heroics?! Wally, I'm not ruling it out! Just over five minutes to go, people. In the spirit of objectivity, though, compare France 2014 to France 2010 and it's easy to see why they're so jubilant today. Admittedly, Germany is as consistent a team as there will ever be, but let's wait until their game with Algeria to make prognostications about their supposed drubbing of France. I put my bet on a France v Holland final, beating Belgium and Brazil in the semi finals, so allez les bleus! Valbuena to Arsenal because the BootGooners link everybody to Arsenal. 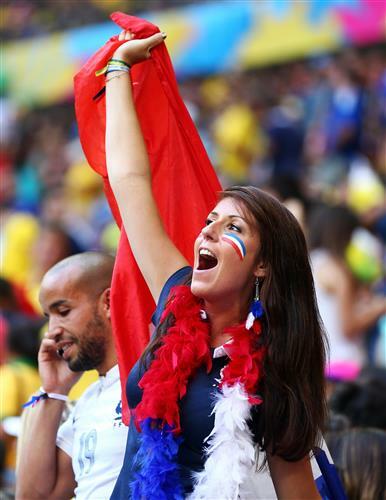 Jubilation for French fans as they're through to the quarterfinals. @Mike: BootGooner - brilliant neologism! The officiating was horrible in this match. It was clear that France should have received 2 yellow cards and the Nigerian striker was not offside when he scored. Nigeria dominated this match but you can't beat 12 players. anyone know the weather conditions of germany-algeria? confirmed officially by DFB, Hummels will not play for Germany, has the flu, Mustafi will play instead, quite a disadvantage, Mustafi has not been very stable against Ghana. Colombia was my dark horse at the start of the WC but now I think Germany will finally do it and win. They are being underestimated and thatll help them. 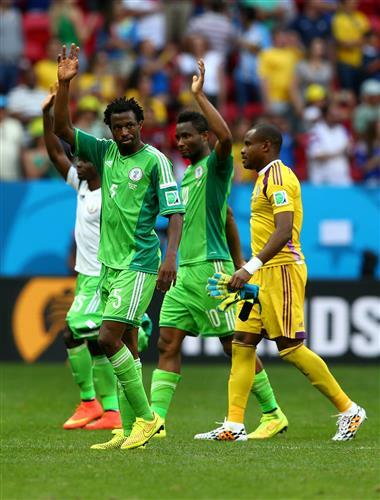 Nigeria fall short, but can hold their heads high after an impressive display. suarez has come out with an apology. anyone believes him ? prnv, Chiellini does - check the tweet below! Germany are anything but underestimated, taka tiki. And I think that's going to bite them in the posterior at the QF/SF stage. Didn't you hear, Suarez fell. We've talked a lot about the players like Ochoa and James who've upped their market value -- who do you think has LOWERED their market value during this cup? Somehow France win this game much easier than the Brazil and Dutch games. Will Lugano be apologizing to Chiellini?